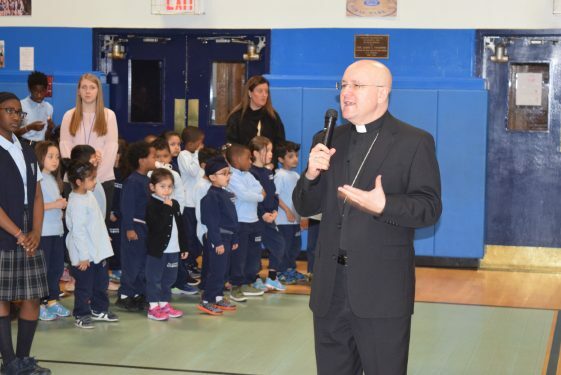 Our Lady of the Snows Catholic Academy, North Floral Park, kicked off Catholic Schools Week with a blessing and visit from Auxiliary Bishop James Massa, Jan. 29. 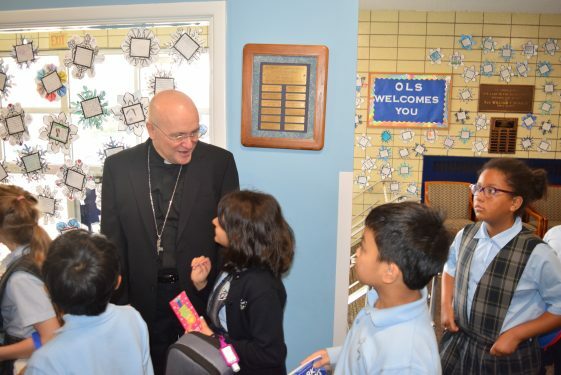 “The diversity of the school is amazing to see,” said Bishop Massa. “The school is made up of students or children of people that have come from many countries in Asia, Africa, the Caribbean, all over Europe and many other places. The bishop praised the multi-media approach used at Our Lady of the Snows. Computer classes start in pre-kindergarten. Students have access to computers everyday and use them for new and exciting programs to further their education. He praised the importance that so many parents put on the value of Catholic education. Principal Joseph Venticinque was excited to begin Catholic Schools Week. “We are so proud of all the work we have done all year and are so happy to have Bishop Massa here,” he said. 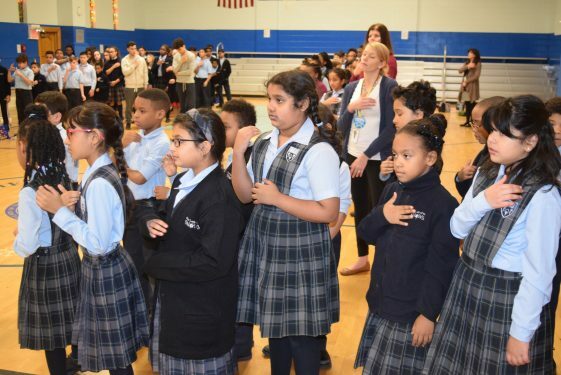 Our Lady of the Snows had scheduled a busy week with an Open House and Spirit Day on Tuesday. Wednesday was a Disney-themed dress down day with money being raised for “Give Kids the World Village” Foundation. Friday was Student and Teacher Appreciation Day with a Career Day Assembly. 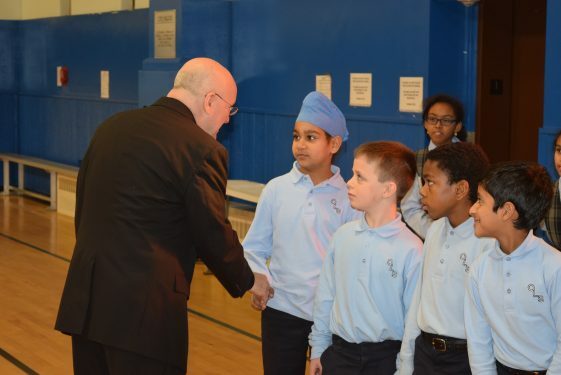 Father Kevin McBrien, pastor of Our Lady of the Snows parish, accompanied Bishop Massa during his visit. 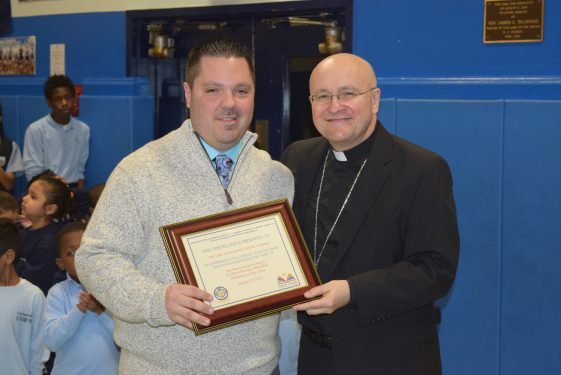 “I always find this to be an exciting time to showcase what we strive to do for all the Catholic schools,” said Father McBrien. “Knowing these children will be able to take from what they learn here to go on and be prepared for so many challenges in life is great. 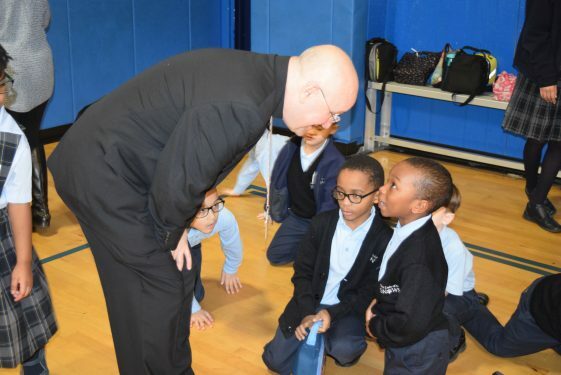 Bishop Nicholas DiMarzio and the other auxiliary bishops of the diocese were visiting other Catholic schools in Brooklyn and Queens during Catholic Schools Week.